(This post is based on a post that was first published on Sept 19th, 2017 on Medium, and has been updated and more current here, including details of the publication of the library and example(s) on GitHub). In this post, I’m going to show you how I built an Arduino energy monitor and data logger that would help me to gather current and energy data for different loads easily, and plot that information using a program like Excel. Some of you might be aware that I’ve created a new energy monitoring breakout board that I call Dr. Wattson (which is based on the #Microchip #MCP39F521, a power monitoring IC) along with an #Arduino library and #Python library (for boards like #RaspberryPi and #BeagleBoneBlack) for easy integration of quality energy data into your next project! If you haven’t heard of it and would like more information, check out https://upbeatlabs-wattson.launchrock.com/ for more information. It is also available on Tindie. To help me study the energy characteristics of different loads, I went ahead and created an Arduino Energy Monitor and Data Logger, which is the subject of this post! It consists of an Arduino (of course!) talking to the Dr. Wattson board to get energy data, along with an SD card to write the data to. I’ve also added a button to toggle the data logging, along with an LED indicator to show when data is being logged. The button along with the LED made it really easy to initiate data logging when I had the appropriate load plugged in. To facilitate the logging and subsequent analysis, I also implemented a log rotation scheme, so each run will be logged to a different file. The output is in CSV format, which means it can be easily imported to Excel (or Numbers on Mac or other equivalent), and the data plotted. I later updated the enclosure a bit and it is now available on Tindie. This is what it looks like now. A little more cleaned up with and additional IEC socket, and spade connectors for easy connections. I have prepared a User Manual showing how the wiring is to be done, which is now available on GitHub. The digital out that is coming from Dr. Wattson is completely isolated from the mains, as the energy measurement is done in an isolated manner using current and voltage transformers, so the digital out is perfectly safe to handle. I used an SD card breakout similar to the Adafruit one (so I used that in Fritzing, as that was the closest part). The connection is pretty standard — CLK (Arduino Uno pin 13), MISO (Arduino Uno pin 12), MOSI (Arduino Uno pin 11) and CS (Chip select). CS is configurable, though it defaults to pin 10 for hardware CS — I just use that. For the button, I use the Button library by Jack Christensen, which provides debouncing and a variety of useful stuff in an easy to use package. (https://github.com/JChristensen/Button). The button is using the Arduino’s internal pullup, so it doesn’t have any external pullups and also uses inverted logic (high is OFF, low is ON) — all of these are configurable as parameters to the Button constructor! I’ve hooked up the button to pin 4, but you can use any available pin you like. The only downside is that I have to be content to use the breadboard image of the “generic IC” part that I modified to represent Dr. Wattson. C’est la vie! Ok, now to move on to the actual programming! Let me first start by explaining the sketch. In setup(), I first set up the SD card communications, and Dr.Wattson communications by calling their respective begin() methods. I also initialize the LED pin as OUTPUT. The button is declared globally so I don’t have to do anything in setup for the button. //from Arduino pin 4 to ground. In the loop() function, once the button is pressed, it toggles the readData variable, which controls if I read the energy data. If the button is toggled again, I stop the data reading/recording. Once I compiled and uploaded the sketch to my Arduino, getting energy data was pretty easy. I plugged in the load of choice — a CFL lamp. I wanted to see the current and energy consumption from a cold-start perspective, as well as a warm-start. I plugged in the lamp, but didn’t turn it on. I pressed the button on my circuit to start the energy measurements — when it was logging, the RED LED told me so! I then turned on the CFL Lamp, and waited until the I thought I had gotten enough data — you see, the CFL, when starting off, consumes more energy than advertised (in my case, a 14W CFL bulb), and then settles down eventually to about 14W. I waited until the readings had settled down. I then pressed the button to turn off the reading. I could now eject my SD card and start looking at the data! PS — To log data from additional devices, all you have to do is reset the Arduino — it will pick the next available DATAXX.CSV to log the data into, so you can easily keep the data separate. This only works on a regular terminal that can accept terminal commands like the above, and does not work on the Arduino Serial Monitor unfortunately. However, once you try screen, you may never go back to Arduino Serial Monitor! 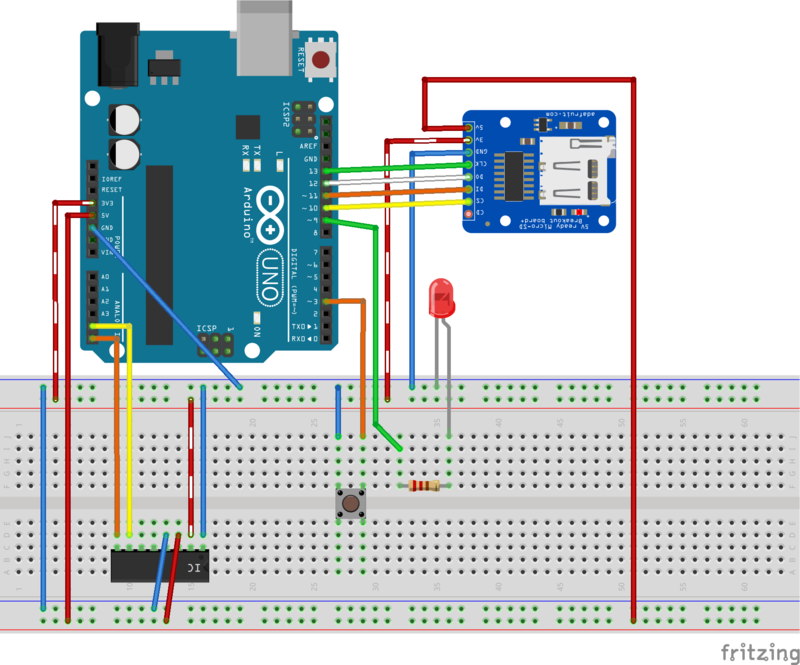 where the first parameter is the “serial port”, and the second is the speed you have configured for your Serial connection in your Arduino sketch. A note on the units: the current is A/10000 and energy is W/100 — these allow the values to be in the same range for plotting together to see trends. The current peaks at around 0.21 amps before eventually settling to about 0.18 amps. The active power peaks at about 17 watts before eventually settling to about 14.2 watts. After it had settled, I switched off the CFL and waited for a little while, before turning it back on again (hence the drop in the current in the chart above). You can see that once a CFL has “warmed up”, it quickly settles to it steady state consumption. There’s a lot of interesting data and experiments you can do with energy data from your appliances and devices. I was excited to start getting my hands on some data and sharing them with you! My goal with Dr. Wattson is to enable quality energy data for the Maker and make it more accessible, so you can use it as a building block for your wild and crazy ideas. using multiple Dr. Wattsons together with a single MCU (by changing configurable I2C addressing). If you are interested in energy monitoring and like Dr. Wattson, please sign up at (https://upbeatlabs-wattson.launchrock.com/) to stay abreast of news and updates! Here is the entire Sketch, for your reference! You can also find it and the Dr. Wattson library, along with a host of other examples at the Upbeat Labs drwattson GitHub repository. toggle the data collection, so you can log the data when you are ready. means that the serial output will stay in place and just update over time. change to the appropriate values. active, reactive and apparent power values change. and so on. The logging rotates to new files until DATA99.CSV. The communication happens over I2C. 2 pins are required to interface. ZCD and Event are not used. Button is connected to pin 4. Written by Sridhar Rajagopal for Upbeat Labs LLC. #define DEBOUNCE_MS 20     //A debounce time of 20 milliseconds usually works well for tactile button switches. #define LED 9 // Connect an LED (via a 220ohm resistor) from pin 9 (anode) to GND (cathode). // This is what MCP39F521Data looks like, for reference! Libraries for use with Dr. Wattson Energy Monitoring Board Dr. Wattson is an Energy Monitoring Breakout Board for Arduino, Raspberry Pi and other Maker-Friendly Microcontrollers. Easily integrate quality AC energy measurements into your next project! Based on the MCP39F521, a single-phase power monitoring chip from Microchip, the board is designed to be tolerant of a wide range of voltages, which means that it can also be used with the Raspberry Pi or any other 3.3v MCUs just as easily. The unit comes pre-calibrated (enabling measurements from 1mA up to 4A) to enable you to start taking quality measurements on the get-go with just a couple of simple commands. You don't need any additional CT or other components. If you are a more advanced user, you have a wide range of functionality available from the rich library, as well as the ability to tweak the hardware to suit your needs and recalibrate using the library.